Jodie Carey's Untitled (Slabs), 2012, is an ambitious installation of seven large (about ten feet tall) cast plaster slabs, reinforced with burlap and mounted on wooden armatures. Crowded into this small gallery, they have a stronger, more intimate presence than their display last year in the roomier premises of the New Art Gallery in Walsall, England-an intimacy wholly beneficial to their effect. Gently and painstakingly tinted with colored pencils, the surfaces of the "slabs" bring to mind a portable Sol LeWitt wall drawing, covered as they are in delicate fields of pastel hue that form a striking contrast with their heavy-duty supports, which in turn function as a kind of reality-check. The wooden frames are pinned down by hand-sewn burlap sandbags, an expedient (otherwise the frames might topple forward) that becomes an important part of the design-more "reality." If at first the "slabs" appear as freestanding paintings, the manner in which the support reveals its construction-suggesting traditional plastered supports bound with organic materials such as horsehair-clarifies their status as sculptural works to be experienced in space. Carey belongs to a new generation of sculptors, predominantly female, who combine an exploration of materiality with a strong sense of craft, and an aesthetic of construction verging on the Brutalist. She avoids the common pitfall of overlaying meticulous construction with unnecessary connotation, opting instead to adopt a refined and restrained "it is what it is" aesthetic. 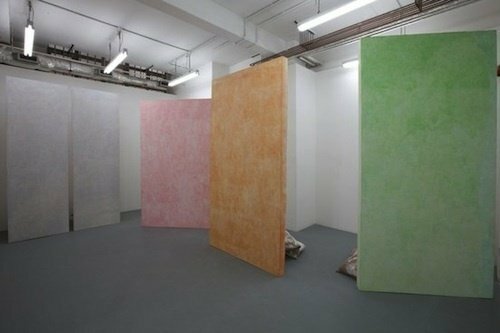 Carey will open two new exhibitions in Berlin later this month, at the Galerie Roland Anselmi and the Neue Berliner Räume; Untitled (Slabs)bodes well for these shows and for her future work overall.